Directions:	In a mixing bowl, toss the pork with the remaining ingredients together. Cover and refrigerate for 24 hours. Remove from the refrigerator and pass the meat through a meat grinder with a 1/2-inch die attachment. Remove half of the meat and pass through the grinder a second time. 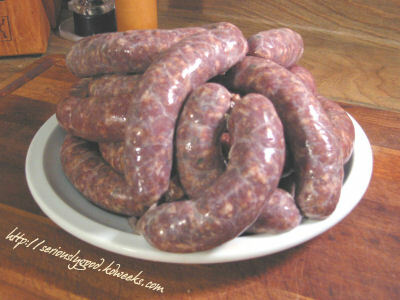 Stuff the sausage into 1 1/2-inch casings or form patties. Tie the casings at 4-inch intervals for individual links. I’ve been searching for a butcher or delicatessen that supplies Andouille in the UK but so far my searches have come up blank. Does anyone know of a company that sells them?